SSC Phase IV Various Posts Answer Key Check Here. SSC Phase IV Various Posts Admit Card CR Region Check Here. SSC Phase IV Various Posts Admit Card Other Region Check Here. SSC Phase IV Various Posts 2018 Exam Date Notice Download Here. SSC Notification is out. 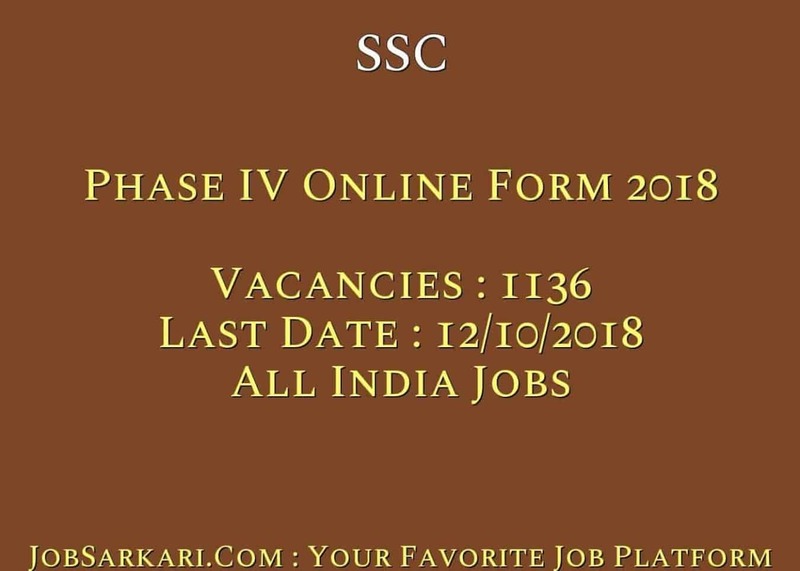 SSC is recruiting for 1136 Phase IV Online Form 2018 Posts. You can check SSC - Staff Selection Commission last date, download SSC notification, visit SSC official website and check other SSC Vacancy details.Complete Vacancy and recruitment Details about 1136 Phase IV Online Form 2018 vacancies in SSC are provided below by JobSarkari.Com only for you. 1.Computer Based Examination (Tier I, II). 7.Online Application Can be Submitted on or before 12th October 2018. Q. What is the Last Date For SSC Phase IV Online Form 2018 Vacancy ? A. 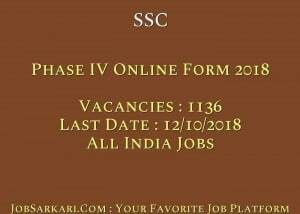 Last Date for SSC Phase IV Online Form 2018 Posts is 12/10/2018. Q. What is the Form Type of SSC Phase IV Online Form 2018 Recruitment ? A. The Form Type for SSC Phase IV Online Form 2018 Posts is Online. Q. How many vacancies are available in Staff Selection Commission Phase IV Online Form 2018 Posts ? A. There are about 1000 Vacancies in Staff Selection Commission Phase IV Online Form 2018 Posts. Whether we have to send the hard copy of the application form to the regional office after the payment of prescribed amount ? There is no Need to Send the Hard Copy you Just Need to Apply Online. HELLO SIR……i am applying for ssc phase 4 from 5 to 6 days but, their is a site problem……i cant able to fill the form …..and today is the last day…..